The Rebecca Winters’ gravesite is one of the few graves of the 6,000 Latter-day Saint pioneers who died while making the journey across the plains to the West. She was traveling in the James C. Snow Company in 1852 when an outbreak of cholera took her life. William F. Reynolds inscribed her name and age onto a discarded iron tire. 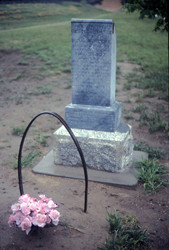 It reads, “Rebecca Winters – Age 50.” Several individuals traveling west made mention of the grave as they passed it while traveling through the area. In 1902, when surveyors were planning the Burlington Railroad through the area, the grave with the iron tire was again discovered. The railroad decided to redirect the rail line out of respect for this noble pioneer mother who died on the plains. Also, the railroad constructed a small fence around the grave to help protect it. Rebecca was the grandmother of Augusta Winters Grant, wife of President Heber J. Grant. In 1902, Rebecca’s descendants erected a monument to her at the gravesite. Additionally, in 1929, a marker was erected and unveiled by the Daughters of the American Revolution with the words “A Daughter of a Revolutionary Soldier” inscribed onto it.1 President and Sister Grant as well as many other members of the LDS Church attended the unveiling. In 1995, the grave was moved to prevent visitors from wandering too close to the railroad, which was only six-feet away before the move. The site remains a tribute to all pioneer mothers who died along the trail. 1 “Plains’ Grave Is Remembered after Century Passes,” Improvement Era, November 1929, No. 1. Source(s): The Autobiography of Asa S. Hawley, Family and Church History Department Archives, The Church of Jesus Christ of Latter-day Saints, 2; The Autobiography of William Henry Stewart, Family and Church History Department Archives, The Church of Jesus Christ of Latter-day Saints, 1-2. Helen Hughes Vick, “Woman of the Dead,” Friend, April 1993, 16.